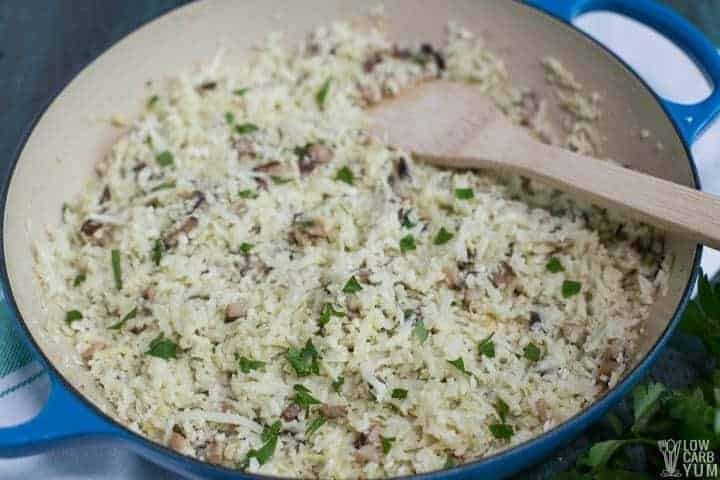 A paleo friendly cauliflower rice risotto with mushrooms makes a great low carb rice substitute. 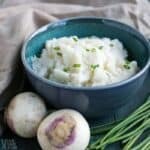 It’s a simple side dish for any keto meal. 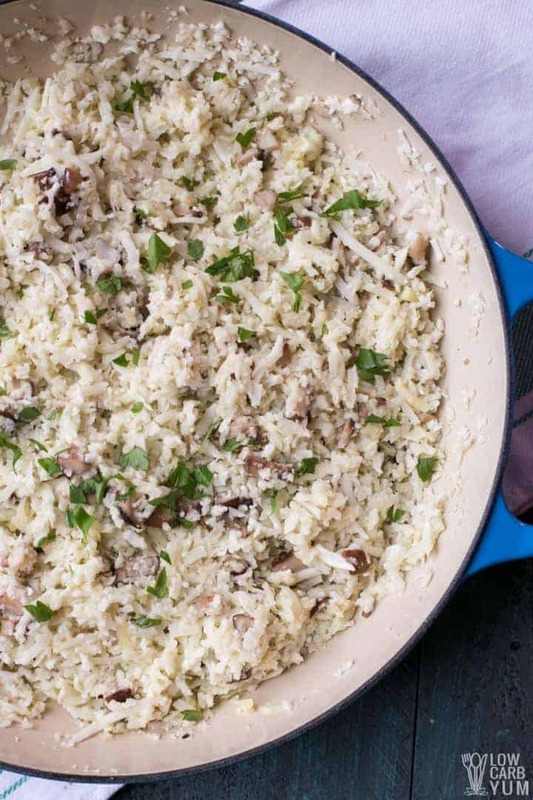 There are so many delicious ways to enjoy riced cauliflower. 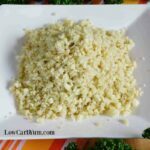 Of course, there’s the basic cauliflower rice recipe to use in place of white rice. 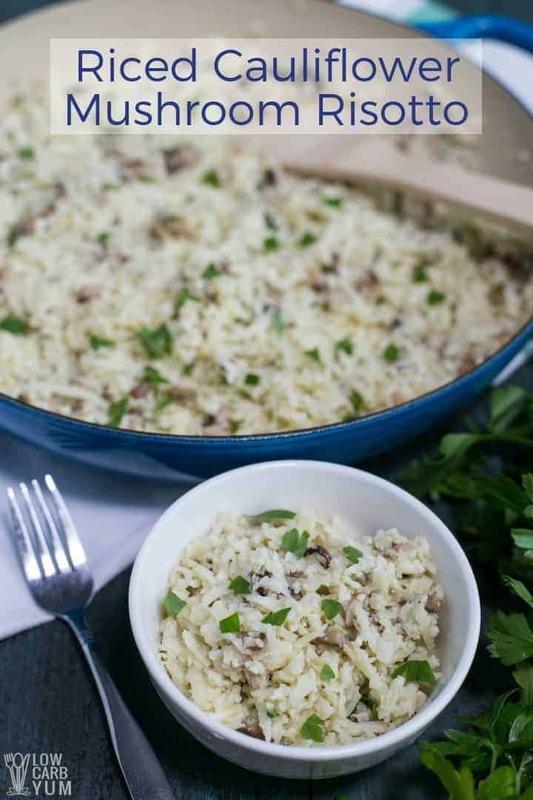 And although I really love keto fried rice, risotto is another way I like to serve it. If you’ve never had risotto, you might be wonder what it is. 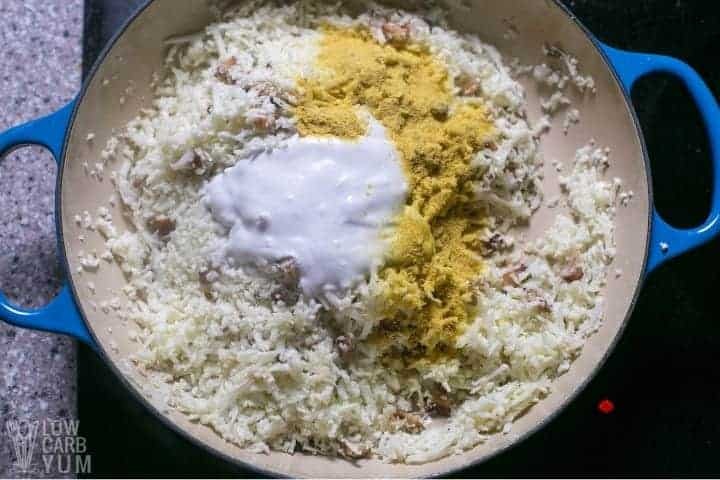 It’s an Italian style of cooking rice in broth along with other ingredients like meat and vegetables. 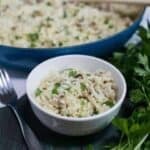 A popular dish is mushroom risotto so that’s what I like to make as a side dish for easy keto meals. A lot of recipes include things like butter and parmesan cheese. But since I try to stay away from dairy, I skip the cheese and use butter flavored coconut oil for sautéing. Sometimes, I’ll use a little dry white wine in place of some of the broth as well. 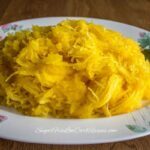 This is actually a really simple low carb side dish that’s easy to prepare. And it goes really well with any type of main meat dish. I start out by sautéing a little minced garlic in melted butter flavored coconut oil to keep it dairy-free. But butter or ghee can be used as well as a healthy cooking oil like olive oil or avocado oil. When the garlic becomes nice and fragrant I add in some chopped mushrooms. Any mushrooms are fine to use, but I like to use baby bella. Once the mushrooms are tender, I stir in some riced cauliflower. Either fresh or frozen riced cauliflower can be used. The frozen kind will just need to be cooked a little longer. 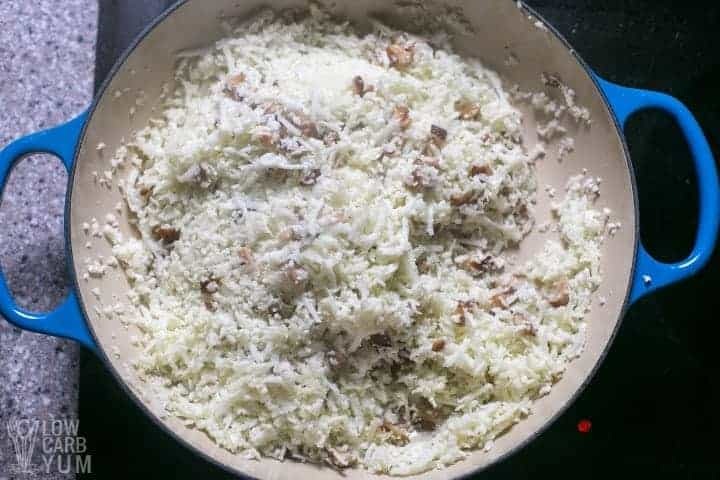 I like to shred fresh cauliflower florets in a food processor to make my cauliflower rice risotto. Since cauliflower rice doesn’t need to be cooked in a liquid like real rice, I don’t bother adding any broth. Instead, I use a little bit of coconut cream. 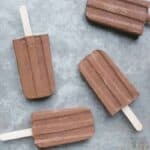 For those that don’t like the coconut flavor, almond milk or heavy cream can be used instead. To give a cheese like flavor without dairy, I sprinkle in some nutritional yeast. Of course a little parmesan or asiago cheese could be used instead. Once the dish is heated throughout, I remove the skillet from the heat and sprinkle on some fresh parsley for garnish. It’s now ready to serve! 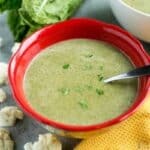 What goes with low carb mushroom risotto? 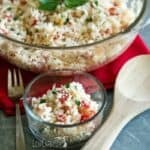 This paleo friendly cauliflower rice risotto is a super easy side dish to pair with any keto meal. 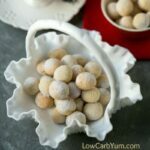 It goes well with a steak or chicken or even a pressure cooker pork roast. But it’s also a vegan friendly dish since there’s no animal based ingredients. 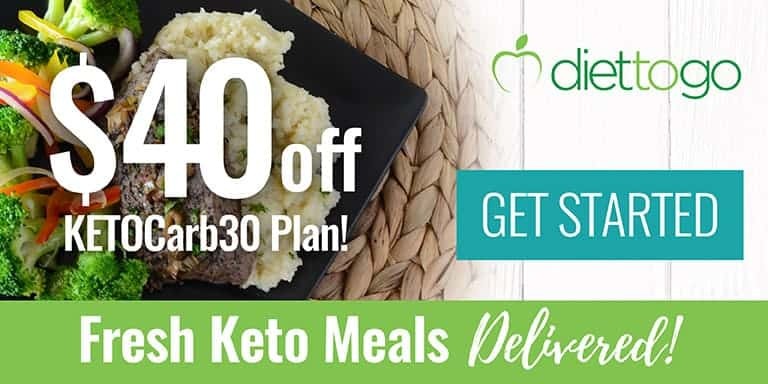 So you may want to serve it with a plant based chicken or beef substitute low in carbs. Or, serve it with a side of asparagus or collard greens. I typically reheat the leftovers for lunch and pair with with a small side salad. Other times, I’ll have it with a baked fish fillet. So there’s a lot of possibilities for enjoying it along with any meat or vegetable. 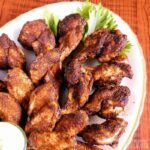 Enjoy this easy and versatile recipe. And be sure to let me know what you think in the comment section if you do give it a try. If you love cauliflower rice, why not give one of these other recipes a try, too? A paleo friendly riced cauliflower risotto with mushrooms that vegan and low carb. 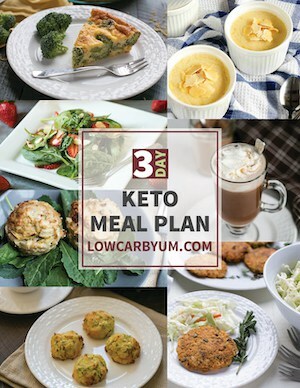 It's a simple side dish for any keto meal. Over medium high heat, melt coconut oil in a large skillet. Then add garlic and cook until fragrant and slightly golden. Add mushrooms and sautée until tender and lightly browned, about 4-5 minutes. Add in the riced cauliflower and stir until well blended with the mushrooms. Stir in the coconut cream and nutritional yeast until heated. Remove from heat, garnish with parsley and serve. Butter, ghee, or cooking oil can be used in place of the butter flavored coconut oil. 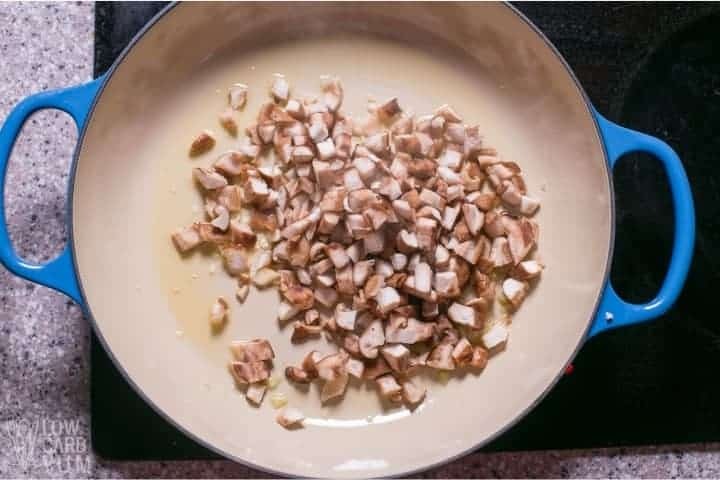 Heavy cream can be used instead of the coconut cream and cheese can be used in place of the nutritional yeast if dairy-free and vegan is not needed. 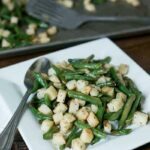 This low carb side dish can easily be made into a meal by adding in meat like beef, chicken, pork, or shrimp. 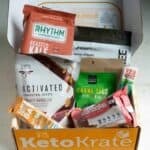 Vegan meat substitutes work well too.